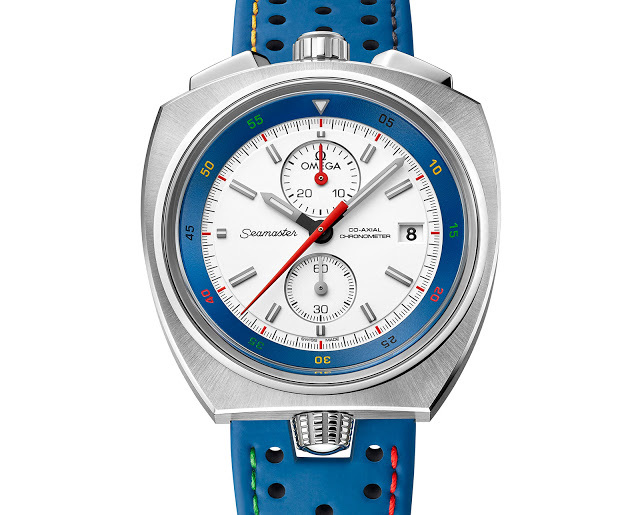 Made to commemorate the Rio 2016 Olympic Games, the Seamaster Bullhead Rio 2016 adds a colour twist to Omega’s distinctive 1970s chronograph, in a limited edition of 316 pieces. 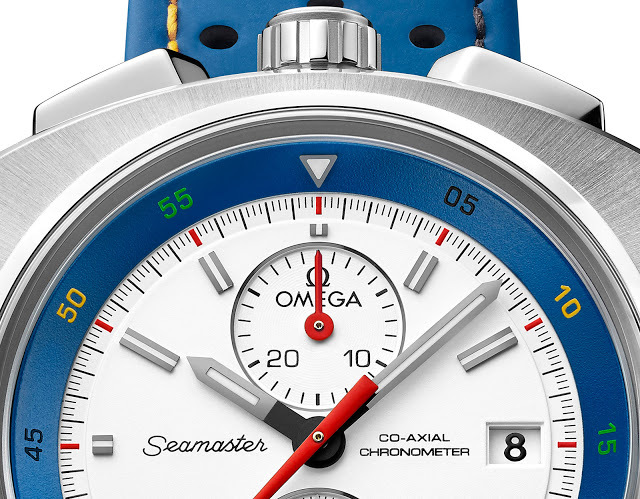 As the official timekeeper of the Olympic Games, Omega counts down each year to the upcoming games in Brazil with a limited edition, with this year’s edition being the Seamaster Bullhead Chronograph Rio 2016. 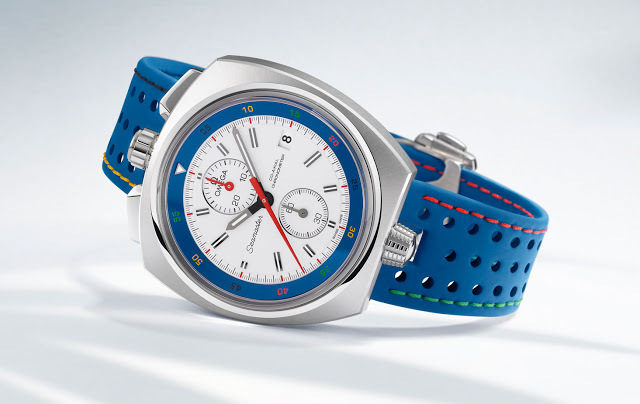 A sequel to the Speedmaster Mark II Rio 2016 introduced last year, the Bullhead is based on the historic remake of a 1970s classic. Nicknamed Bullhead for the position of its chronograph pushers, the Rio 2016 limited edition has a white dial with a blue inner bezel and minute numerals in green, yellow, red and black – the colours of the Olympic rings. The strap has a similar colour combination. The steel case measures 43mm by 43mm, with the crown at 12 o’clock for winding and setting, while the crown at six o’clock turns the inner bezel. Inside is the Omega calibre 3113, a self-winding movement with a 52 hour power reserve. It features a column wheel and vertical clutch for the chronograph, as well as the efficient Co-Axial escapement invented by George Daniels. 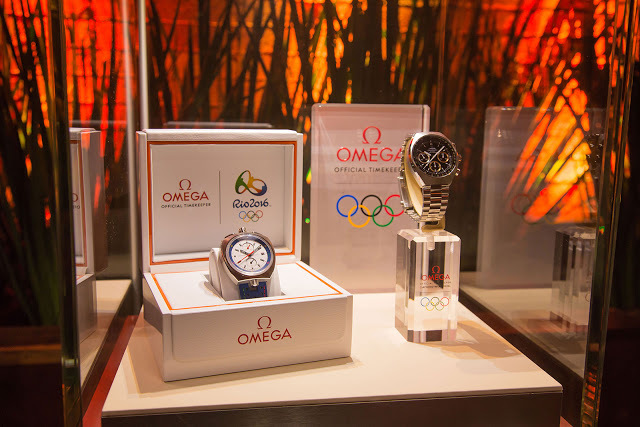 Made in a small run of just 316 pieces – a curious number arrived at by combining 2016 with the third time golf is being included in the Olympics – the Bullhead is available only at Omega boutiques, priced at SFr8000 or S$12,400.